Karima Christmas helps Summer Crew member Grace Poole water a tree planted by Casey Trees. 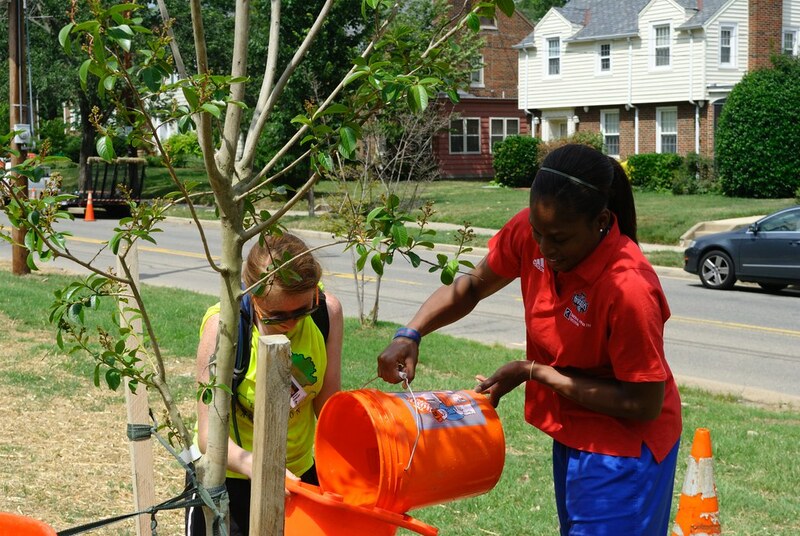 This past Friday, June 24, members of the Washington Mystics joined Casey Trees’ High School Summer Crew to help water trees at Michigan Park in Northeast, D.C. Victoria Dunlap and Karima Christmas – both rookies for the Mystics – were the players in attendance. Between the efforts of the Mystics and the Summer Crew, 54 trees were watered, including all of the recent Casey Trees plantings as well as plenty of other trees in the park. Casey Trees planted 21 new trees at Michigan Park during a particularly rainy Community Tree Planting event last April. (View photos on Flickr) In the District, summertime is an especially critical time to monitor your trees’ health, so this week’s watering provided some much needed care to these young trees! To learn more about watering, check out our Tree Watering Guide – a best practices guide to keeping your trees hydrated in the summer’s heat. To know just how much water your trees need for the week ahead, follow our tree watering recommendations on Facebook or Twitter every Monday throughout the summer. This week's watering recommendation is "Normal" so watering is optional, although there are likely plenty of hot and dry days ahead this summer so be sure to keep them watered well. See more photos from this tree care event at Michigan Park on Flickr.